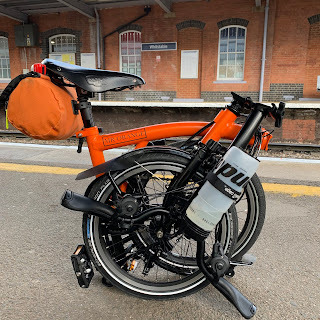 My Orange Brompton: Speed...on a Brompton!! No, not that sort of speed! I am talking about speed...going faster on your bike as if ones very life depended upon it. Speed has been a slight preoccupation of mine the past few weeks. It has dominated my thoughts and I have pondered its wonders. I blame the Nocturne Folding Bike Race I recently participated in and the impending Brompton World Championships. I seem to have endurance conquered. In the past a ride of say 10 miles would have seemed almost insurmountable. The thought of 50+ miles would have brought on a fit of the vapours. Now, things are very different. I have been on several rides over 60+ miles and coped pretty well. The day after is always a good indication of ones fitness and so far I have felt pretty good, not suffering from any ills, other than the desire to go on more rides of similar length. At the Nocturne I did not make the final. I am 43 years young and many riders were approaching 20 years younger but a gentleman named Brian who is older than I tore through the heats and to the final and when in the final placed very well indeed. Another rider Alastair, of similar year to myself did much the same. Mark (King of the Hills) again of a similar age to me did the same. Laurence, who was recovering from a rather nasty fall didn't go as fast as I did - almost certainly due this - but his technique was peerless. It was smooth and efficient...elegant almost. Even Peter that nice chap I met on the Tweed Run who is in his 50's positioned ahead of yours truly. The truth of the matter is that I am happier to mince around like a dandy of yesteryear in my finery but I still want to go faster. Kojak tyres instead of Marathon's. Front carrier block off to aid aerodynamic efficiency. Brook saddle off to be replaced by an Italian super lightweight razor blade. Lightweight road bike helmet rather than one that is simply orange. Lose a a couple of pounds of weight. I write deluded as I know that all of the above will not make me faster. In a recent edition of 'Cycling Weekly' there was an article entitled, '41 ways to go faster.' This obviously caught my attention and imagination and I read it with an eager frenzy. All 41 ways of going faster were digested and I have to say many I am doing already. Doing micro intervals where you pedal with perfect technique flat out for 6 - 30 seconds during a training run. Work on your weakness where you think honestly about your likes/dislikes, strengths and weaknesses and work on the dislike and weak areas rather than ignoring or avoiding them. Increase revs not gears is where you use a low gear and pedal at a greater rate, rather than struggling in a high gear. If it doesn't make you faster don't put it on your bike. A very interesting point that I have certainly embraced and feel I could do much more on. Ride in the best kit you can afford. There is a time and place for budget cycle attire but quite often you do get what you pay for. Having good equipment - clothing - certainly makes for a more comfortable ride. Drink beetroot juice. High in nitric oxide it also lowers blood pressure and improves exercise tolerance. Just ride. Quite simply get out on your bike! The above is taken from the 6th June 'Cycling Weekly' and with another 33 ways to go faster it is certainly worth buying. Tomorrow a new pair of clip less pedals should arrive in the post. I plan to put them on to my Titanium Orange Brompton and it will mark the start of this attempt...desire to go faster. Clip less pedals will prove to be very helpful on many of the longer rides I have planned and hopefully allow me to pedal in a more efficient fashion but as for speed...we shall see! I shall be following your clipless adventure with interest, as I feel strongly that some form of 'foot-fixing' is a great aid the efficiency. Also I think that most of the weight savers that you list deliver marginal gains to the very fit. Perhaps point 8 is the most productive - as well as being the cheapest! As long as you are having fun. Go for it. All are great ideas. You will gain better overall fitness and develop a leaner body engine by riding more often. Titanium Brompton M6E X Almost Ready! I'm not alone in my like of the colour Orange! I finally go clipped in on my Brompton...again! !